Once we have begun to make positive changes in our lives and found stability in mood and behavior, it is important to develop a plan for sustaining these changes. Regardless of what we are working on in therapy and/or in recovery, I recommend that everyone develop a relapse prevention plan. This will provide a structured approach to increase our chances of countering any triggers or urges that could lead us to a symptom relapse. Before we start to experience a decline in mood, thought, or behavior, let’s identify what factors contribute to when we are feeling stable. What does it feel like when things are going relatively well? Describe the emotions we are feeling. What activities are we engaged in? Who are we with? Where are we spending our time when things are stable? It is important to identify these stability factors so we can establish a baseline for our moods, thoughts, and behaviors. Identify what signs, circumstances, or situations may indicate that we could be about to experience a symptom relapse. What are some of the things that we may notice in ourselves when things are starting to slide? What does it feel like emotionally? What does it feel like physically? Is it associated with any particular people, places, or things? Be aware of our thoughts, feelings, words, and actions, and how we may be changing our response to stressors. Seek feedback from others. What might people in our support network notice when we are starting to decompensate? People who know us best will likely be able to identify when we are struggling, noticing that perhaps we are isolating, not responding to calls or texts, disengaging from recreational activities, or even exhibiting erratic behavior. Be open to feedback because in many cases our support network might see indications of our backsliding before we do. Next, identify some basic steps we can take to stabilize thoughts, moods, and behaviors. This can include activities as simple as taking a walk around the block, or reaching out to a friend, family member, a peer in recovery, or a therapist. Have a list of people that we can reach out to, whether it be on the phone or in person. Often just having someone to connect with can avert relapse. I strongly recommend writing down responses to these prompts and to keep this plan handy, whether it be on paper, computer, or smartphone. Just thinking about these things is not enough, because when we start to experience a slip in mood, we can easily lose perspective and forget our plan. When we take the time to write out our plan, we can refer to it to help pull out of a downward spiral of mood, thought, or behavior, and hopefully prevent a full-blown symptom relapse. 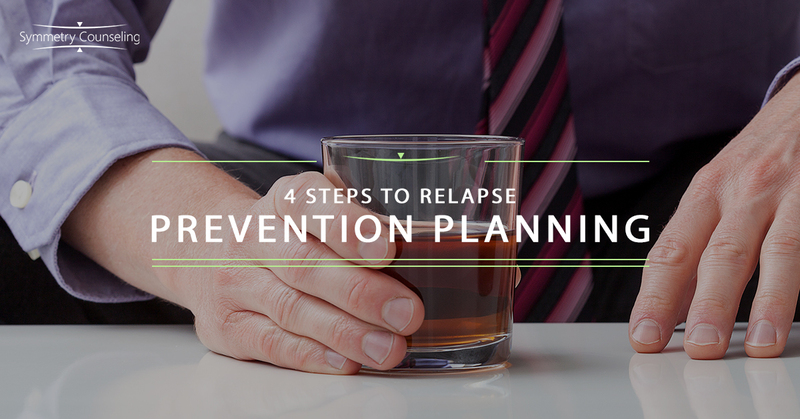 A good relapse prevention plan is a useful tool that can help us avoid backsliding on the positive changes we have already made in our therapies and recoveries. It is always better to plan and be prepared, and then not have to utilize it, than to find ourselves backsliding towards relapse and not having this therapeutic safety net. Here at Symmetry Counseling, we work with our clients to not only help make positive changes in life and relationships, but also how to sustain those changes and prevent falling back onto old patterns. Contact us today for a free consultation with our behavior change specialists.